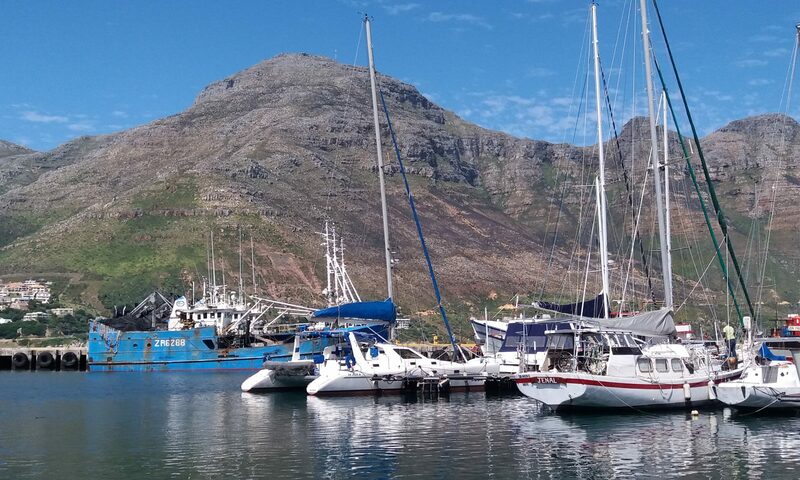 We sailed Moondust to her new mooring at the Hout Bay yacht club, about five minute’s drive from where we live, with the help of a professional skipper, Craig Rosen. On the first night of our voyage Pete and I momentarily shared the same bucket and whilst his seasickness improved, the bucket remained with me throughout the whole trip. This stretch of coast is known as one of the most dangerous, with many shipwrecks along the Wild Coast that bear silent witness to just how treacherous the sea around one of the big three Capes of the world can be. The first fish we caught on Moondust! Hout Bay harbour on a perfect day. Since that day in October 2016 Pete has worked non-stop to repair whatever needed fixing on Moondust and also pre-empt what could possibly fail during our planned circumnavigation. He has tried to do everything himself to learn as much as possible as there will be no help in the middle of an ocean! My first day on the new job, 1st May 2017, was quite a come-down! The day prior I was still in my well defined job as editor at Tracks4Africa and the next I was deckhand, assisting the captain in clearing a clogged toilet. I won’t go into that gory detail, but I can assure you that unblocking a toilet must be the most unpleasant job on a boat! Suffice to say that since this unfortunate incident we have put up a notice in the heads (the toilets) to explain to our guests how to use this sensitive system. I thought most of the hardware repairs were done once Moondust was back in the water after being on dry ground for almost a week to repair the sail drives, replace the thru-hulls and anti-foul her hull. She was far more gracious about this affair than should be expected. For me beholding her out of the water was like seeing a lady with her skirt up; unbefitting. During this process on the hard we weren’t going to leave our girl to the mercy of the notorious ‘skollies’ in nearby Hangberg, so we kept a close eye on her 24/7, even sleeping on board. Despite this the ‘skollies’ managed to pinch a pair of my best sneakers which, to prevent Moondust being covered in the filth and grease of the dockyard, I had left on the sugar scoop (the back steps). The thieves were quite picky as they left Pete’s worn-out footwear which was right next to mine. Our view from the dockyard was beautiful. The next big job was mechanical and I became Pete’s spanner girl when he fixed the slipping clutches on both engines. After that the chores became a lot easier for me; we used a perfect 6 day weather window to repaint the decks. Apart from covering up a few of the old girl’s blemishes, we were hoping to make slippery patches non-skid. We used about a quarter of a kilometre of masking tape! In the meantime we developed reservations that our dinghy with its 15HP engine was way too heavy for the two of us. Four adults battling to get it off Moondust and bring it home for repairs confirmed this. Even without the outboard there was no way that Pete and I would be able to drag it above the high tide mark whenever we used it when anchored offshore. Researching the ideal dinghy, selling the old one with its engine and acquiring a suitable second-hand inflatable boat with smaller outboard proved to be quite a time consuming process. There are just so many things to think about when preparing a boat for circumnavigation; none of them easy if you haven’t done it before! Having our life raft serviced was one such job and we found being present when they opened it extremely insightful. It is good to know how to handle it, what it’s like when inflated and what is packed in it. Another item on which our lives could depend when out at sea is the desalinator. Pete got the old water maker up and running and discovered that the centre block was cracked. Fortunately a new block and spare membranes are a fraction of the cost of a very expensive new water maker, however, each such item adds to the long and seemingly never ending list of escalating expenses. One of our biggest planned disbursements still to come related to our mode of communication, which is vital out at sea as our safety will depend on getting regular and reliable weather updates. On researching this subject on the Cruiser’s Forum we learned that the most affordable means would be with a high frequency single side band (SSB) marine transceiver, which would have the added advantage of enabling us to stay in contact with other cruisers. However, while the running costs of an SSB would be significantly lower than that of a satellite phone, the initial outlay is high. We were very fortunate in making some excellent contacts with local ham radio enthusiasts which led to our securing a good second-hand SSB marine radio with modem which would enable us to get weather reports and send and receive emails. Whilst we have the radio, tuner, modem and antenna, it still has to be installed and I am booked on a week-long radio course in the first week of August to legalise its use. With the SSB radio we’ll be able to communicate with stations and ships a quarter of the way around the world, as well as our friends and family at home. Moondust also has a short range VHF radio with which we’ll be able to communicate with ships in our line of sight. Finally we’ll also buy a limited contract for Moondust’s satellite phone to use in case of an emergency. The acquisition of this HF radio epitomises the learning curve associated with the many technologies on a boat; amateur radio operators spend their whole lives becoming experts in this field. We cannot afford that sort of time and will have to learn just enough to make it functional. Two big projects still remain: Pete wants to put in a new autopilot and keep the old one as a back-up since spares for it are no longer available. Secondly we have to install sufficient solar panels and batteries to power all our energy hungry equipment. At this stage getting a steel structure built for the panels, which will also serve to carry the dinghy and radio antenna, is proving to be challenging. Just as we have discovered that there is no such thing as a quick and easy job on a boat we have also learned that marine items are far most costly than their equivalent on land. Other practicalities that also needed attention included measuring the space available for storing food and buying sufficient and the correct size plastic containers, getting new passports, getting quotes for moving the household contents and storing them as well as advertising for a tenant and preparing the house for rental. Our plan is to live on Moondust for the last few months before our departure, which now seems possibly to be a bit later than we initially anticipated. In doing some research on our route, I found that visa constraints in Brazil and the five month hurricane season in the Caribbean make early January 2018 a more ideal time to leave, rather than November 2017 as first planned. An earlier departure would mean a long layover just outside the hurricane belt once our visas expire in Brazil. In amongst all this I set to re-stitching all the canvas covers on Moondust – an ideal job for a girl. However, we had the bulky cockpit covers repaired by a tailor with an industrial machine. A new skill that I had to learn was to make soft shackles from dyneema rope. This incredible material is far stronger than steel, weight for weight, and we have found several critical applications for them, where a steel shackle wouldn’t work. We had also read that an air scoop is extremely useful in the hot tropical climates to get airflow through the bloat on a hot day. I had to research and improvise, but ended up with an air scoop that would allow us air movement through the cabins. All work and no play makes Pete a dull boy! So, we also made time to enjoy Moondust and embrace our new adventure…. Pete made sure we’ll be able to put up our hammocks once we have time to enjoy the good life of sailing. I learned to hoist Pete up the mast to install energy saving LED bulbs in our navigation lights. The view from up top was beautiful! That speck at the top of the mast is Pete. The view from the top of the mast. One of our most liberating achievements was when we managed to berth Moondust on our own, meaning that we no longer needed help on board to assist. For me it was particularly empowering when, at the helm, I learned to dock Moondust, with Pete as the line handler! We’ve entertained many friends and family members; people seem to love the feeling of being in a totally different world once they’ve set foot on the water. Sometimes we just had lunch on board and other times we went out sailing. Isabella and Lineke Groenewald were among the family members that thoroughly enjoyed the sailing. The beautiful view from Moondust’s mooring. Elizabeth du Preez with Houtbay’s Sentinel Peak in the background. Our first big outing was over New Year 2016 when we sailed to Langebaan with Megs and Colin, Pete’s daughter and her partner. Leaving for Langebaan: Pete, Colin and Megs. As I still got very seasick during this trip, we intensely researched a possible solution and learned of an epilepsy drug that was useful to many sailors. Since neither pressure point armbands nor Stugeron worked for me, I thought my last resort might be cannabis oil. However, I was very relieved to find that Phenytoin Sodium prevented any symptoms. Not being seasick made sailing so much more fun! I particularly enjoyed the times when Pete and I went out on our own as I could then get to know Moondust more intimately. I loved the gentle cradling at her bosom and the warm way in which she welcomed us into her heart…. We both became more familiar with all our sails and it was particularly exciting when we learned to use our genneker. The genneker is a powerful and colourful sail used for sailing downwind. We also tested our parachute anchor at sea and practised our anchoring skills, which was made far easier with our new electric anchor chain winch, called a windlass. Testing out our parachute anchor which is used in very stormy weather in deep sea. Another milestone was our first overnight solo sail aiming for Langebaan. We headed north but the wind only carried us as far as Dassen Island where we spent a glorious day at anchor in a deserted bay before we sailed back. Setting out early morning for Langebaan. The view of Dassen Island through our porthole. It’s very difficult to describe everything that needs to be done to prepare for a circumnavigation, but you can see that our days are full and the preparation never ending. However, we feel that we’ve made good progress and that our new adventure is slowly but surely becoming a reality! Dankie Beth, ons sal jul op hoogte hou. Jul moet ‘n slag saam kom seil voordat ons in Januarie die Suid-Afrikaanse waters verlaat. Thanks for the update and it certainly gives some idea of the preparation needed for such a voyage. I can’t even begin to imagine all that must be done with my experience being limited to overland travel. I’m sure that at the end of the day you will look back fondly and with a great sense of achievement on these times. Peter, being experienced only in overland travel thus far ourselves, I can assure you that we are going through a huge (but exciting!) learning curve. What an adventure. You two are amazing. I look forward to hosting you in Sydney. No rush!!! Thanks a lot Baz. On the eve of our departure we are really excited and certainly hope to see you in Oz! Bon Voyage and happy sailing from the Melbourne connection. Thanks Rick. Just to let you know that we sailed to Royal Cape yesterday and will be leaving Cape Town in about an hour for the Atlantic and St Helena. This is fantastic. We look forward to journeying with you. And it comes at a time when we are enjoying “Twenty Four Feet of Adventure in Rebel”….for the second time. All the best.